All in all, we really like CBD Essence hemp taffy. They tasted good and were a fun alternative option. They’re also ridiculously cheap compared to CBD gummies, on a price per mg of CBD basis. What we didn’t like was the so-so customer support and the fact that they had so much sugar, although that is to be expected from taffy. CBD Essence hemp taffy seemed like a great change of pace to the CBD gummies we were used to. The brand we knew, and taffy we love from our youth, so this had to be good right? Let’s see how it did. What started out as a small CBD business back in 2012 has quickly blossomed into a national brand. CBD Essence says they are based in Colorado because they use hemp grown in that state. However, they’re actually owned by NutraHemp, which is based in Florida. Regardless of that confusion, they have one of the most affordable product lines today, and somehow they don’t cut corners on quality. They also own the Hemp Taffy brand, which is sold on the CBD Essence website. These are in our CBD gummies category, but as you can tell by the title they actually aren’t gummies, but taffies! That got us excited because taffy really reminds you of being a kid. They come in chocolate, peppermint, and orange mint flavor options, and each piece of taffy contains 10mg of full spectrum CBD oil. You buy them by weight, starting at a ½ pound, which is a bag of 36 pieces. They’re also available in 1 and 2-pound bags. Our first thought on CBD Essence hemp taffy was about how professional this bag looked. It’s designed well and has all the important information a customer needs, front and center. Upon opening it up, we were glad to find that these taffies were individually wrapped and withstood the rigors of shipping. Taffy can lose its consistency if it isn’t packaged well, because of heat sources, but these were perfect. For this review, we chose the chocolate flavor because, well, who doesn’t love chocolate? With all the CBD gummies we were used to, this was a welcome change of pace. This CBD Essence hemp taffy really did take some of us back to our youth, as we playfully held them in our mouth and let them dissolve, per the instructions. The flavor was really nice, although a bit too sugary for a few of us. It is taffy, after all. We would start with one piece of taffy, let it slowly dissolve in your mouth, and give it some time. Usually, we’re on to our second piece by the early afternoon, and a third at evening time if not more, but judge it by how you feel. CBD Essence advises you to take 3 to 5 daily for palliative care, which is meant to provide comfort to those in need. 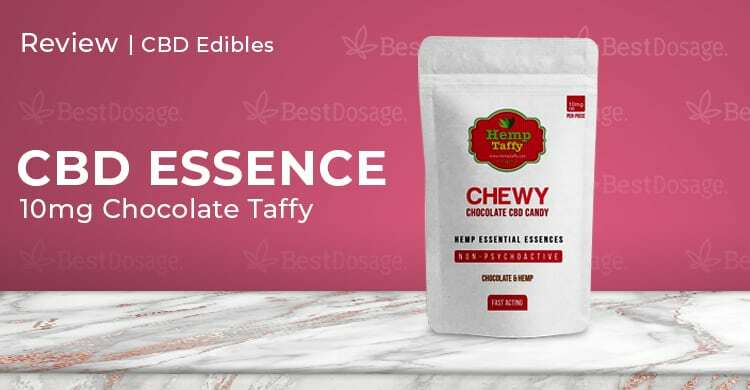 CBD essence hemp taffy tastes really nice, but we weren’t sure how it would affect us compared to the gummies we were used to. Thankfully, it worked more or less as expected. It worked especially well for pain, but not as well for insomnia. Perhaps that had to do with the high sugar content. Some of us had to take two at a time to really feel something, so it may not be as effective for more veteran CBD users. You have both email and a toll-free number available to you if you need customer support from CBD Essence. They don’t have a live chat and their responses via email were a little slow for our taste. They get a passing grade here, just not exceptional in our book. Free USPS Priority shipping on orders over $99. Otherwise $5 flat rate. $34 for ½ pound, which is 36 pieces of taffy. $55 for one pound, or $95 for two pounds. These are a great change of pace and are definitely worth buying, even if not as a primary source of CBD.